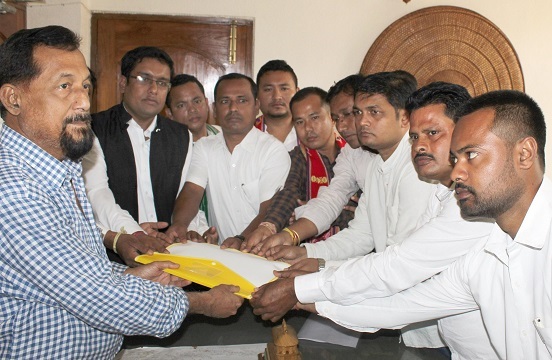 The Kamrup (Metro) unit of All Assam Students Union (AASU), as decided earlier to put pressure on the legislators and ministers individually on Citizenship (Amendment) Bill 2016 issue, called on Dispur constituency MLA Atul Bora of the ruling saffron party on Sunday and sought his support in scrapping the bill. The AASU delegation also submitted a demand letter before the ruling party MLA. AASU president Dipanka Kumar Nath toldNortheast Nowthat the students’ body and other 26 organisations would continue its protest and put pressure on the government to withdraw the bill immediately. “As a part of our continuous agitation, we have started to call on the MLAs and Ministers individually seeking their support to protect the communities by scrapping the bill,” Nath said. Moreover, Lakhimpur unit of AASU called on Asom Gana Parishad (AGP) MLA Utpal Dutta while Bihupria unit called on BJP MLA Debananda Hazarika and Naoboicha unit called on All India United Democratic Front (AIUDF) MLA Mamun Imdadul Haque Chawdhury on the issue.